Red Light! Green Light! Numbers? This is such an amazingly simple and spot-on idea that I hope it makes its way to the States. Of course, if it already has, would someone please drop me a line so I know where to move the family next because any city, municipality, village, hamlet, burg, or one-horse town that adopts this concept is where I want to be. 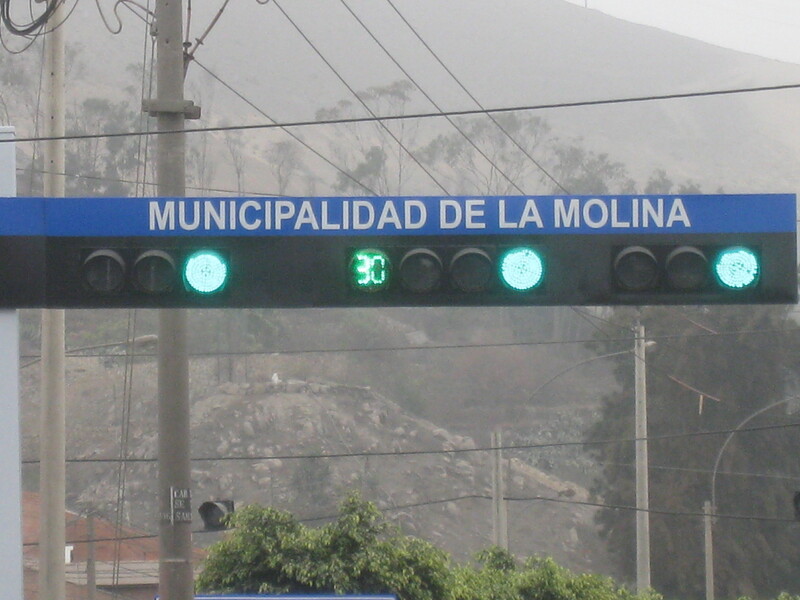 Traffic lights in Peru utilize the same green light-amber light-red light set-up that, I believe, is the standard throughout the world. Having not travelled throughout the world, I am taking this on faith and, again, readers can leave missives in the Comments section below to let me know that, for example, in Burkina Faso, traffic lights use mauve instead of amber. 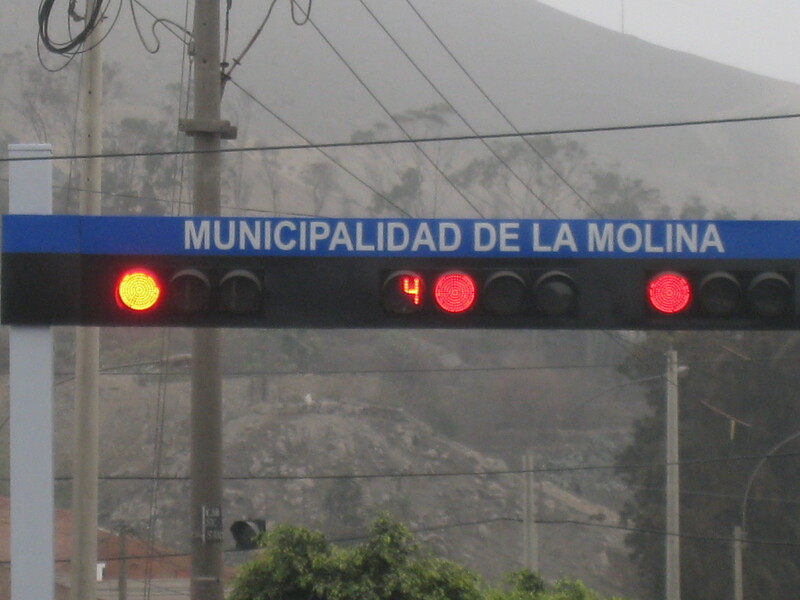 However, and this is where the genius comes into play, traffic lights in the city of Lima and its various districts, also employ a countdown timer. These gradually decreasing numbers let the driver know how much time is left in the red light so they know how much longer they can spend reading the newspaper (which is almost as big a national sport as futbol). When the light is green, the countdown lets the driver know how much they have until the light says “Stop” so they know if they need drive even more erratically than they normally do here down in the City of Kings. Simply put, this is a great idea. Now how do I contact the makers of traffic lights in the States? I will write about this later, but I am becoming a convert to the coin society that exists down here in Peru. The Peruvian currency, the nuevo sol, has bills whose lowest denomination is the ten. Below that value, the five , the two, and the one nuevo sol are only represented by coins. The nuevo sol is subdivided into 100 units called centimos, much like the United States dollar is subdivided into cents. Centimo coins come in values of fifty (cincuenta), twenty (veinte), ten (diez), five (cinco), and one (uno). Below is a scan of the one centimo coin, which is about the size of a pinky fingernail. Because the one centimo coin is not often used (and is quite small), merchants and restaurants round up or down all their items to the nearest five. It is rare, when not in the grocery store, to have to pay a bill that does not end in either S/. X.x5 or S/. X.x0. The exception here is the grocery store where some items, especially those found in the fruit and vegetable aisles, wind up costing a total ending in all manner of digits. When checking out of the grocery store, if the last digit of the final tally ends in 1, 2, 3, 4, or 5, the store will round down. For example, (and for those of you who don’t recall your elementary school math) a figure of S/. 45.43 will be rounded down to S/. 45.40. This means a tiny savings has been passed on to me, lucky shopper that I am. When the last digit of the bill ends 6, 7, 8, or 9, the store will round up the final total to the nearest tens digit. This means I need to pay the extra centimos, but I don’t feel too bad about this because the store doesn’t take the extra money into its own coffers. Instead, when the total is rounded up, I am asked if I would like to donate the one to four centimos to a local children’s charity. “Quiere Ud. donar?” (Would you like to donate?) I am asked at the checkout and I always answer “Si”. At the most, it’s only four centimos, but as the saying goes, every little bit helps. End Note: A tip of the hat to James Gurney for his Code of Dinotopia (from his marvelous book, Dinotopia: A Land Apart From Time) from which I took my title. The long Southern Hemisphere Summer Vacation that started at the end of December for our trio of progeny is nearing its end. School starts up soon and I could not be happier to see my offspring back on a normal schedule. To occupy our children’s time during this break from their School, we had them sign up for activities that were sponsored and hosted by the agricultural university near our neighborhood. It wasn’t the Parks and Recreation Department from our county in northern Virginia, but it did the job quite well. This post is not to bore you with all the cute things my children did and made during their various classes (maybe later though), but I only wanted to share with you an incident that was new for my city eyes. Since this locale of higher learning that I took my children to was centered around agriculture, there was a farmer’s market on the grounds where people could go and buy local produce. For security reasons, all folk who left the university by auto had to have their trunks inspected to ensure that the items on their receipt were the items in their car and not a leaf or husk more. It reminded me of a combination of the agricultural checkpoint that exists on the California-Nevada border that was placed there to keep the local flora and fauna safe from invasive species and the guy at Costco who circles your receipt as you leave the store. …a complete, whole, and utterly dead pig with a gash down its stomach from stem to stern. As a throughly urbanized man, I was quite surprised to the carcass of an animal residing in the back of a car. I was amazed at the breadth of products one can buy at our local agri-university. I pondered if a dead pig has a stench to it and how long it would take the cab driver to remove it. All in all, I felt like I was following a car making a delivery to the crew of Mythbusters. Disclaimer: Sadly, one animal, of type Sus scrofa, was harmed for the making of this blog post. I have begun my quest to master (or at least quasi-understand) the Spanish language as I signed up for a two-part Spanish immersion course. This is the type of “sink-or-swim” class where the teacher speaks nothing but the target language and the students cannot speak their native tongue. We had ninety minutes of class instruction and then we all piled into a van for a guided tour (solely in Spanish) of the center of Lima. Pictures from that excursion will be highlighted in another posting because this ramble will be about my discovery for a possible answer to a question that has nagged me for some time. Trust me, I will be able to bring a question about the city so nice they named it twice back to the subject of the Spanish language. There are more than a few websites that claim to have the answer as to why New York City has a nickname that ties it to a juicy red fruit. This posting from About.com is one of many that states that ‘apple’ was a term for horse racing venues, of which there were many in New York City, at the start of the 20th century. Infoplease says the term was coined by Edward Martin in 1909 as he used it in a metaphor to describe how New York City received a disproportionate share of the sap from the country’s tree of wealth which, then, was rooted in the Mississippi Valley. The Wikipedia entry for Big Apple contains these and other explanations as the origin of the term “The Big Apple”. What I found intriguing in that article was the notation that the fruity moniker was used in a reference to Los Angeles. This brings up the possibility that the phrase “Big Apple”, circa 1920, meant any large city, but its use towards the City of Angels brings up a more interesting answer. As I learned in today’s immersion class (see…I told you I could bring it full circle), the Spanish word for a square city block is manzana. The Spanish word for “apple” is exactly the same – manzana. The term made its way East and Gotham writers took up the nickname to refer to their city, which they saw as the biggest apple in the nation. Of course I have no proof of this other than my own hyper-active imagination, but it did make me pay attention for the rest of the class to see what other conundrums I could solve. First, the background to this week’s Photo Challenge from WordPress with the theme of indulge. Security is extremely important to folks living in Peru. The website, How to Peru, has a good article on the public’s perception of safety in many Peruvian cities. Here in Lima, Peru’s capital city, there are many folks who are employed in security services who guard businesses and homes. In our little slice of suburbia, some of our neighbors hire individual personnel to watch over their abodes during the weekends. From Friday all through to Sunday, these hired hands sit dutifully and do nothing but stare at the locked gates of their charges. 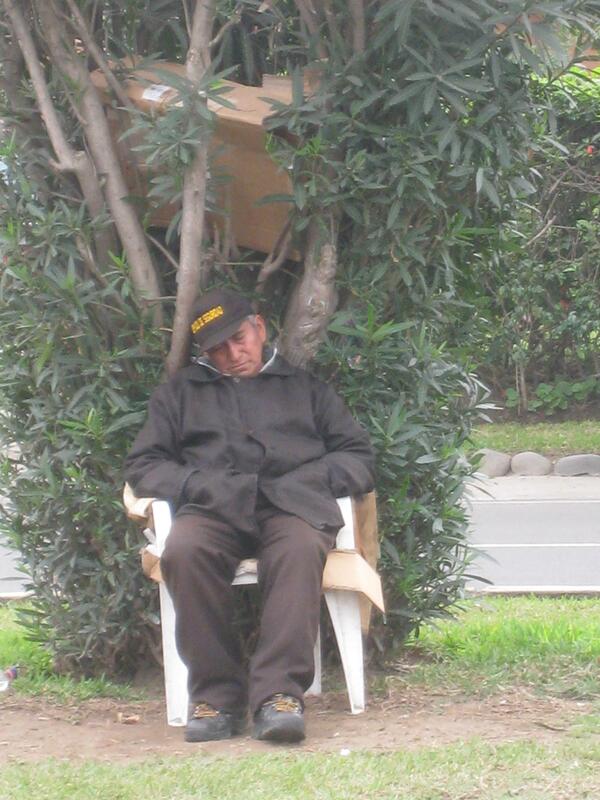 I can be so sanguine about this slumbering security officer because it ain’t my house he’s watching. Today was the first full day workers were in our house doing some maintenance. This will be a two-week affair as a sextet of men drill away at the concrete of our home and install heating and cooling units. As the men begin their day of work, I begin my day of basic housework (sweep floor, laundry, make beds, etc.). What must these men be thinking about me? Were these gentlemen wondering why I, an able-bodied man, was doing (heaven forfend) woman’s work? Or, were these gentlemen thinking how lucky I was to have my wife go out and do all the hard bread-winning work while they had to lug around heating and cooling units and all I needed to do was fluff clothes. Courtesy of my poor language skills, I could not satisfy my curiosity as to what their perceptions were about me. All in all, all that really matters is what I think of myself – which is that I am indeed lucky. Before taking my mother-in-law (“suegra” in Spanish) and the rest of our family to the seashore mall known as Larcomar, having a wonderful buffet full of ceviche, pulpo (which would be octopus), and other assorted Peruvian cuisine at Mangos, and before snapping the picture that was featured here, we took the whole family unit to Inka Market so that mi suegra could browse for, shop for, and buy all manner of Peruvian crafts including scarves, jewelry, and gloves. Sure, I could fill up this posting with pictures of all sorts of handmade merchandise and snapshots of quaint, small shops all tightly packed into a convenient shopping area for tourists, but my eyes spotting something else that I feel should be addressed. 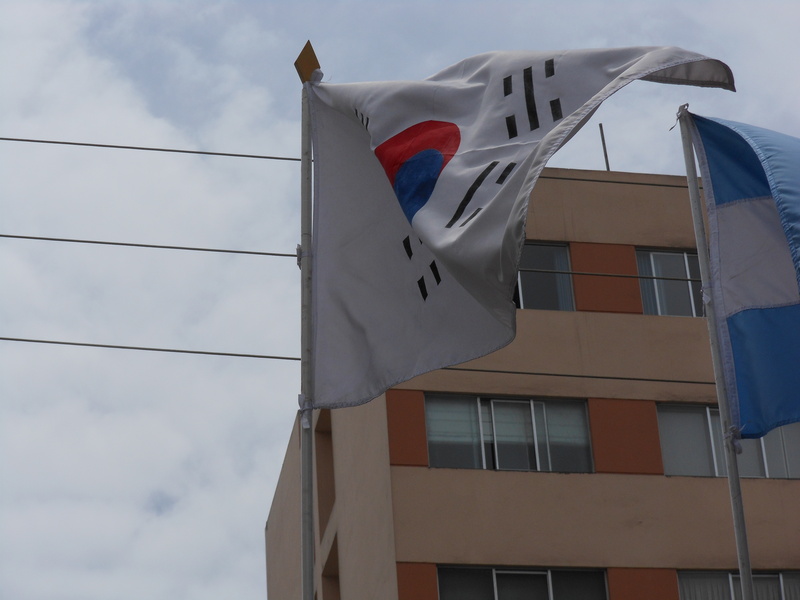 This is the flag for South Korea and while the above picture does not do its mistake full justice, this banner is not the official Taegeukgi. You can jump to the link I offer above and see that the sets of lines that are on the bottom-right and bottom-left of the flag are not the same as the official version. This next picture has a double-blooper. The Israeli flag looks correct but only because the perspective of my shot is off. 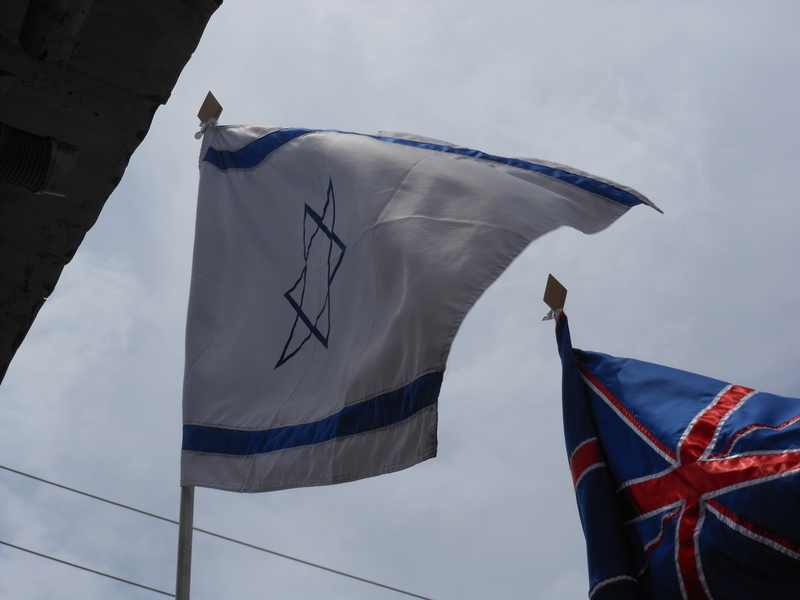 In reality, the top and bottom points of the Star of David that make up the centerpiece of this banner are not straight up and down as they are in the official version. Here at the Inka Market, the Star is lopsided. The flag next to it is the Union Jack, the banner of the United Kingdom. The red stripes that form the horizontal and vertical cross are too small and there is not enough white space on this incorrect flag. To be fair, the Inka Market is not the only place in Peru where a flag can participate in a game of “What’s Wrong With This Picture”. 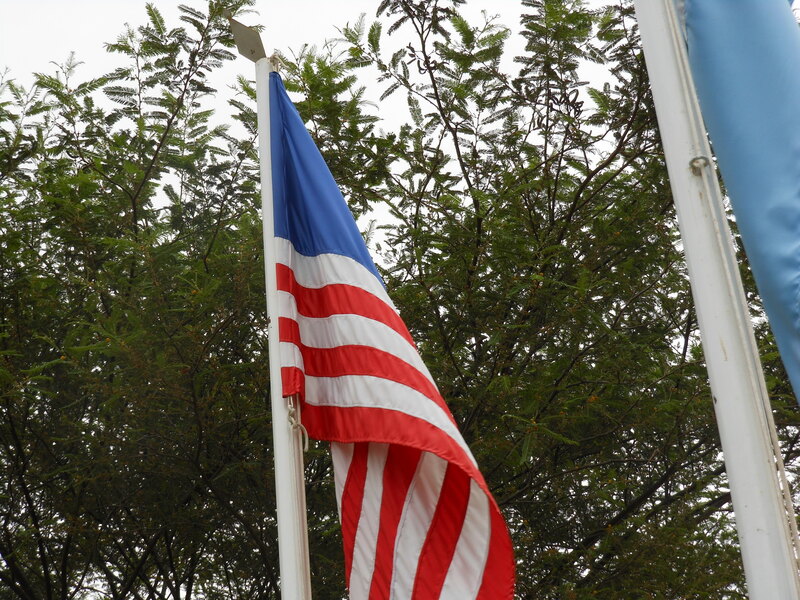 Why is the flag of the United States that flies in Laguna Huacachina similar to the original version of the film Habeas Corpus as pitched in Robert Altman’s movie The Player? Because they both have “no stars“. The latest theme for the Weekly Photo Challenge from WordPress is Down. The family, with my visiting suegra (Spanish for “mother-in-law”), took a weekend trip to the towns of Ica and Paracas, which is a lovely three-hour ride heading south from Lima on the Pan-American Highway. Our first stop was near Ica, at a place called Laguna Huacachina. This is an oasis that is surrounded by massive sand dunes. 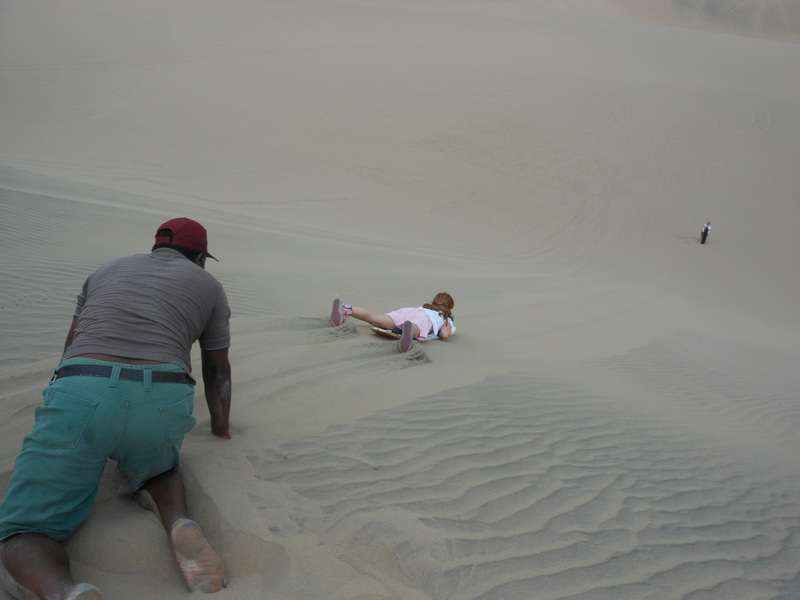 One of the activities that can be done is to rent a driver who will take you out in his dune buggy and give you a ninety-minute heart-stopping thrill ride up, down, sideways, and backwards across the dunes that comprise this desolate and sandy landscape. It’s like a roller coaster, but without knowing where the track is…and half the time, I don’t think the driver did either. In addition to that gasoline-fueled ride, our driver stopped five times and offered us the chance to ride sandboards down the sloped dunes. With the exception of mi suegra, all of us partook of this new experience. The photo you see above has my daughter in the center just as she starts her first ride of the day. You can’t hear her squeals in this snapshot, but they are there. The dot at the right is my lovely wife at the end of her initial run. The perspective, I believe, gives you a sense of the distance my daughter has ahead of her. The man on the left was our driver who, yes, drives a dune buggy barefoot. 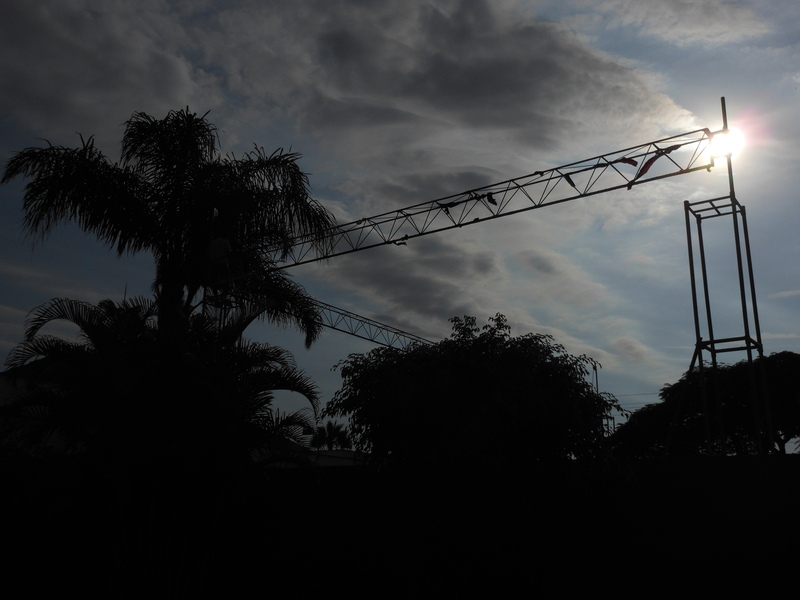 The possibility of trouble brewing over this upcoming weekend is building – literally. 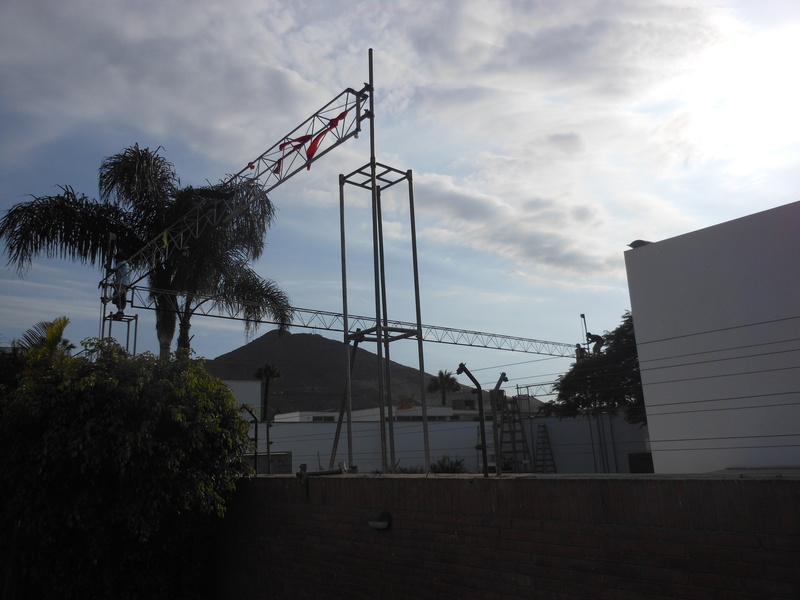 One of our next door neighbors is having scaffolding erected in their backyard. Insert Tab "A" into Slot "Z"
...and they do quinceaneras, also. 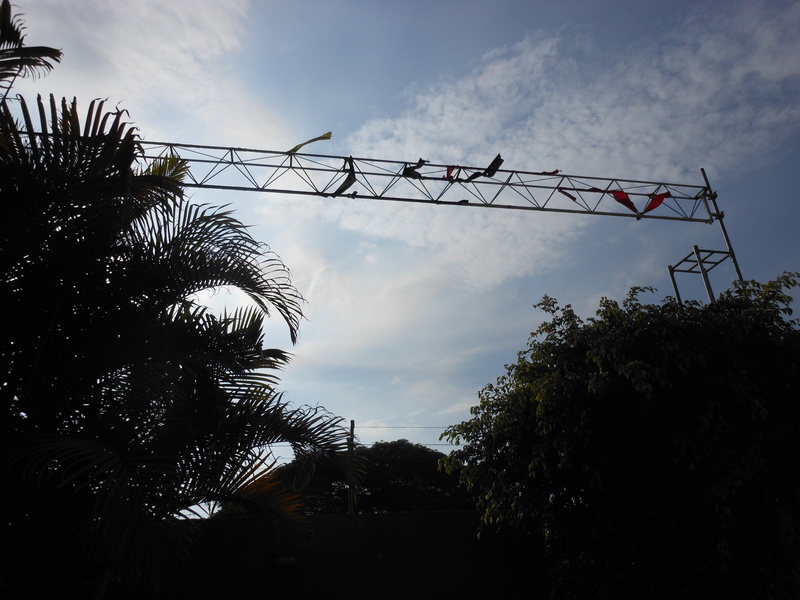 Outside our house is a large truck with men scurrying back and forth and going up and down this growing structure. We have seen such an edifice going up before in our neighborhood and it usually means one thing. More than likely, this will be one of those parties that keep us awake at night, similar to what happened on our first night in Lima (as previously read on Sin Polaris). Scaffolding means lights. Lights means music. Music means dancing. All of which adds up a great heap of decibel-ness known un-scientifically as noise. It’s Wednesday as I write this which means the skeleton of the structure will be completed Thursday and fully decorated on Friday in time for the evening festivities most likely slated for the 17th. Well, sleeping in on Saturday is so overrated anyway. When we last we left our heroes, they had been completely flummoxed by the Peruvian custom of being asked how would they like to cancel their take-out order from Pardo’s chicken. On this night, we find myself, my lovely wife, and our adorable trio of children at a restaurant called San Antonio ready to enjoy a light supper. My lovely wife asks for a pair of empanadas. When it arrives, she additionally requests of our waiter to have him bring her a side dish of salsa so that she may further enhance the flavor of her meal. To both my lovely wife and myself, salsa is a condiment that is frequently used to dip tortilla chips into, but is also employed to enrich the flavor of many foods. Regardless of how one uses salsa or how many additional spices and peppers are thrown into the mix, salsa is tomato-based. So, our surprise was palpable (and palatable) when the waiter returned with a bowl of marinated and jullianed onions (or cebollas in Spanish). This, in Peru, dear readers, is what they consider to be salsa. It’s not extremely useful when you have a pile of chips you want to dip and it’s not all that helpful when you want to add a zing of peppery tomatoes to your empanadas. However, in its own right, they are quite tasty. And another lesson learned in the difference between the Spanish I learned in high school and the Spanish spoken in Peru. …when our hero tells a woman that he is not an interesting person.